Norris McWhirter, co-founder of the Guinness Book of Records, died at the age of 78, on Monday, April 19th, 2004. He suffered a heart attack while playing tennis at his Wiltshire home. Norris traced his McWhirter ancestors back to the town of Maybole. In June of 2003 he returned to Ayrshire as the keynote speaker for a McWhirter Clan gathering. His sudden death was a loss felt by all those with connections to the McWhirter family. During the 1970s and 1980s he was a fixture of the BBC One children's show Record Breakers, hosted by the late Roy Castle. McWhirter, whose identical twin brother Ross was murdered by the IRA in 1975, had also been a successful athlete and worked as a BBC sports journalist. Like his brother, he also held strong political views. McWhirter's family said in a statement: "Norris cared passionately about Great Britain, democracy and the rule of law and was always active in politics, but usually behind the scenes. "The two things he attached most importance to were the freedom of the individual and the sovereignty of the United Kingdom. Apart from his family, his great loves were visiting the 1,049 offshore British islands and having a good game of tennis. He was energetic to the last." McWhirter's family said in a statement: "Norris cared passionately about Great Britain, democracy and the rule of law and was always active in politics, but usually behind the scenes. The two things he attached most importance to were the freedom of the individual and the sovereignty of the United Kingdom. Apart from his family, his great loves were visiting the 1,049 offshore British islands and having a good game of tennis. He was energetic to the last." More from the BBC News website. From: THIS ENGLAND, Spring, 1999, Page 61 A Silver Cross for the courageous twin who fights for our freedom. By David Leake. Norris McWhirter, who has dedicated many years to speaking out in the cause of Britain's sovereign independence, and our right to choose and control our own destiny. Defenders of Britain's sovereign independence have devised a sweet way of crystallizing the humbug and doubletalk shrouding moves towards a federal Europe. They have been tucking into "Euro Fudge" courtesy of The Freedom Association; a body fiercely determined to protect Britain's independence and with the boxes comes an ironic message. Delivered by the association's chairman, Norris McWhirter -- a name with which millions readily identify -that says: "Not the world's greatest Fudge. That is still in the making." It is a typically trenchant comment from a man who has dedicated many years of his long life to speaking up for Britain. He has done so with a singularity of voice and purpose that have become impossible to ignore. When it comes to defending his country's independence and freedom to control its own destiny, there has been no fudge and no room for mistake about the stance of someone whose tenacity, reinforced by a daunting grasp of British constitutional law, has become an enduring thorn in the side of his opponents. 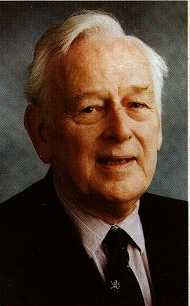 But Norris McWhirter, CBE, MA, author publisher and broadcaster, one of the outstanding athletes of his day, is an internationalist who, in the words of Rodney Atkinson, that other prominent anti-Brussels campaigner, 'defends his nation and its democracy and yet admires, encourages and trades with all the other free peoples and nations of the world." Together he and Norris wrote the best-selling Treason at Maastricht, which has gone into three editions and warns of the threat posed to the British constitution in particular and the nation state in general by moves towards integrating Britain into a European superpower. Recommending his colleague for the silver Cross of St. George, Rodney Atkinson says: "When a nation is in terrible danger, as the British nation is today, we can no longer look -- if we ever could -- to the kind of people who mistake professional politics for democratic leadership. "Instead we must look to real democrats who have understood the essence of freedom and democracy, real leaders who are independent of party patronage or corporate pay- packets, real men of principle who will put their country and their parliament before their political party and their petty ambition. "In Norris McWhirter the British people are lucky to have such a fearless fighter...with the knowledge and courage to point to that which binds us historically into the most successful nation in the history of the world." A ringing citation -- but even with- but his formidable presence at the heart of the European issue, Norris McWhirter's achievements and courage in other walks of life would in themselves merit high recognition. Much of that life was inextricably bound up with that of his twin brother, Ross, whose murder at the hands of an IRA assassin in 1975 pierced him to the heart. 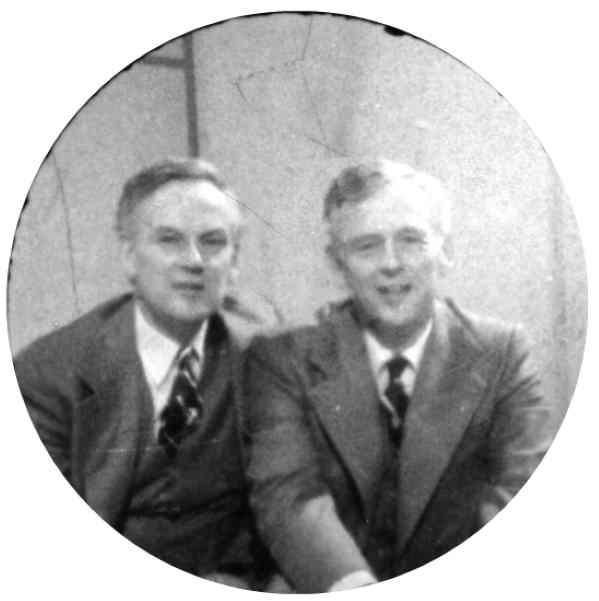 They were born in August 1925, at Winchmore Hill, London, the sons of William Allan McWhirter, managing director of Associated Newspapers and Northcliffe Newspapers Group, and even allowing for the intrinsic closeness of twins their careers, talents and interests mirrored each other to an almost uncanny degree. Both went to Marlborough College; both were at the same college - Trinity - at Oxford University; both were outstanding track athletes, representing their university and running together in the Achilles Club team that won the Amateur Athletic Association 4 x 110 yard relay championship; both served in the Royal Naval Volunteer Reserve in the war, where both saw minesweeping duty, and in addition to other publishing ventures both went on to found The Guinness Book of Records, which became the world's all-time best-selling copyright book. Where athletics were concerned, however, Norris had the edge. He not only ran for Oxford but for Scotland in the seasons 1950-52 and Great Britain in 1951, and in the late Forties and early Fifties virtually monopolized the Middlesex 100 and 220 yards titles, winning them a total of five times. His pace helped to make him an outstanding rugby player, too. He played wing three-quarter for Saracens and won a county jersey with the Middlesex XV in 1950. By then he had taken his first steps into journalism, and his ability not only to perform at sport's highest levels but to describe it informatively and entertainingly opened up ever-widening doors. Both the London Evening Star and The Observer homed in on him as their athletics correspondent for stints that were to last 10 and 17 years respectively, and along the way the broadcasting media pricked up its ears. Norris was dispatched by BBC radio to the other side of the world to cover the 1956 Olympic Games in Melbourne, Australia. That went so well that television work followed, with the BBC choosing him for their commentary team for four successive Games: Rome (1960), Tokyo (1964), Mexico (1968) and Munich (1972). But where television was concerned it was his appearances with the late Roy Castle as co-presenter of the long-running BBC series Record Breakers that made him a "star" and a household name. There have also been appearances on Desert island Discs and Any Questions? and more than 700 radio and TV interviews around the world, many of them promoting the book that first brought Norris and his brother to prominence. Mention its title virtually anywhere in the world and it will be instantly recognizable. The Guinness Book of Records, which they launched in 1954, was to make them internationally famous. They had already established an agency in London to provide facts, figures and features to the Press, publishers and advertisers, and in 1951 brought out their first book. Get to Your Marks, a history of athletics, was critically acclaimed as being "distinguished by a degree of precision and thoroughness which no athletics historian has achieved before." Its successor long ago began creating publishing records of its own. To date The Guinness Book of Records, which Norris co-edited with Ross for 21 years before his brother's tragic death, has sold 84 million copies in more than 400 editions in 37 languages, making it the most phenomenal success in copyright publishing. For Norris, who continued with Guinness for a number of years after the tragedy, there were other editorships -- Athletics World, The Dunlop Book of Facts, The Guinness Book of Answers -- but it was a moving personal memoir that lingers most in many people's minds. Ross -- the Story of a Shared Life, was written within months of his brother's murder. He was shot on his doorstep at his home in Enfield, Middlesex, in November 1975, by two IRA terrorists, and died in hospital soon afterwards. In the previous weeks he had been crusading to raise f50,000 as reward for information leading to the arrest of anyone involved in the London terror campaign in which the IRA had up to then taken 54 lives. On the initiative of his friends, the Ross McWhirter Foundation was set up with subscriptions totaling f100,000 to advance his qualities of "good citizenship, personal initiative and leadership, and personal courage as an example to others". They are all attributes which, as in so many other aspects, are shared by his brother, though Norris -- a trustee of the foundation, which makes annual awards for acts of moral and physical courage -- would be the first to pooh-pooh the suggestion. At heart private and unassuming, when he is away from public service and the relentless demands of his involvement with The Freedom Association, he likes to spend his time "hunting in libraries and visiting small islands". For a man whose achievements, integrity, and steadfastness to his cause are an example to us all - the Silver Cross of St. George. Lady Thatcher and Britain's tallest man were among an eclectic group who attended a memorial service yesterday for the co-founder of the Guinness Book of Records. Hundreds of people packed St Martin-in-the-Fields church, near Trafalgar Square in central London to remember Norris McWhirter. Chris Greener, Britain's tallest man, said Mr McWhirter was always 'softly-spoken' Lady Thatcher arrived wearing a black suit and hat. Other guests included the disgraced peer Lord Archer with his wife Mary and the former Tory MP Neil Hamilton and his wife Christine. Chris Greener, who at 7ft 6in is Britain's tallest man, said of Mr McWhirter: "He was always a very quiet, softly-spoken man." During the 1970s and 1980s, Mr McWhirter appeared on the BBC1 children's show Record Breakers, hosted by the late Roy Castle. Mr McWhirter died at his home in Wiltshire in April aged 78. Mr McWhirter, whose identical twin brother Ross was murdered by the IRA in 1975, had also been a successful athlete and worked as a BBC sports journalist. Sir Roger Bannister, who ran the first sub four-minute mile in May 1954, when Mr McWhirter was one of the timekeepers, was at yesterday's service. Reflecting about his friend in a eulogy, Sir Roger said: "We will miss his cheerful laugh, pungent views and kindness to us." The McWhirter twins set up the Guinness Book of Records in the mid-1950s. Ross became an outspoken critic of the IRA and was shot dead by the group after offering a large reward for information leading to the capture of IRA bombers. Alasdair McWhirter said his father seldom spoke about that time because of the pain it caused. He added that he believed that if his father could communicate one message it would be "stand up for what you believe in". The brothers were vocal on a number of issues and founded a group, the Freedom Association, which campaigned strongly against British involvement in the European Union. However, it was the Guinness Book of Records that gave them worldwide fame and by 1999 the book had been translated into 37 languages and sold more than 87 million copies. Anna Nicholas, who worked with Mr McWhirter, said: "Norris was fierce in his beliefs and was a man of huge integrity who would not be cowed by anyone. " Mr McWhirter is survived by his wife Tessa, daughter Jane and son Alasdair.